The devastating fire which tore through Astley Castle not only ended it’s use as a hotel but also seemed to mark the end as a building. However, a remarkable project by the Landmark Trust is seeking to once again restore life to this battered shell. Although never a proper ‘castle’, Astley was designed as a fortified manor house (see also the beautiful Compton Wynyates nearby). This original house was built largely by the Grey family but it was slighted following the execution of Lady Jane in 1554. The house was rebuilt in 1600 by a new owner, Edward Chamberlain, and it eventually became part of the Newdigate family’s Arbury Hall estate, with a new ‘Gothick’ stable block added in the 18th-century – but with little done to the house itself. The grade-II* listed castle was leased out as home for most of in the 20th-century until the 1960s when it became a hotel until the fire destroyed it, leaving it as a deteriorating ruin for the next 30 years. The Landmark Trust has been attempting to find a solution to this situation since the 1990s, originally looking at plans for a full restoration, but which unfortunately proved too costly. The continued decline of the building fabric gave fresh impetus to their efforts as it was realised that without urgent work the house as a structure would be lost forever. In 2005, the Trust held a competition to find a design for accommodation to be created within the shell as sensitively as possible, which could then be used as a holiday let. The winning design from the architects Witherford Watson Mann will create a modern two-storey structure in the oldest part of the castle, with the first-floor living spaces enjoyed spectacular views across the parkland. A £500,000 £1.47m grant from the Heritage Lottery Fund, plus earlier fund-raising, has taken the Trust to within just £134,000 of the total project cost of £2.3m, and great progress has been made on the scheme. What’s particularly impressive about this project is that it has enabled a full architectural survey of the house, which has revealed many fascinating features as the rubble has been cleared and the later Victorian additions are removed. The Landmark Trust has a strong record of taking on derelict listed buildings, converting them, and finding a long-term sustainable use for them – usually as unusual holiday accomodation. 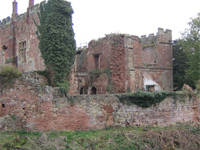 Although it’s not been possible to fully restore Astley Castle as a home it is encouraging to see it being consolidated and enhanced with a sensitive modern addition which will provide the opportunity for others to experience this amazing part of our architectural heritage which was so nearly lost. This entry was posted in At Risk, News and tagged arbury hall, architecture, astley castle, At Risk, buildings at risk, conservation, country house, development, english heritage, fire, grade-ii-star, heritage, heritage lottery fund, houses, landmark trust, listed, parkland, restoration, warwickshire. Bookmark the permalink. The Heritage Lottery Fund grant for Astley Castle was £1,467,000 not £500,000. Thanks Laura – glad to hear that the HLF have been even more generous than I’d put. I’ve now corrected the story.